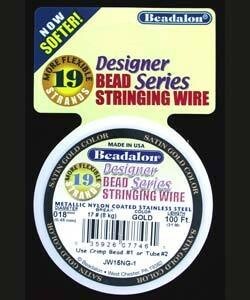 Beadalon wire .015" or .018" is considered the most versatile sizes for making necklaces, bracelets and anklets using medium to heavy gemstones, crystals, seed beads or glass and metal beads. Beadalon19 is more economical than Beadalon49 and only slightly less flexible. Like its name suggests, it consists of 19 miniature stainless steel strands. It is nylon coated for increased kink resistance, longevity, and abrasion resistance. Beadalon19 is also available in more sizes than Beadalon49. The limp, extra supple qualities of Beadalon19 make it well suited for creating superior quality anklets, bracelets, necklaces, watchbands, and other designs. Breaking strength = 15 lb. Spool size = 100 ft.